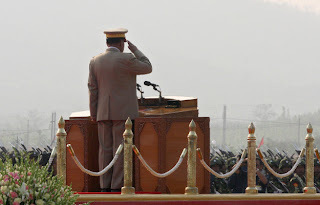 With Burma's government holding a rare election in November, it's fair to wonder whether the military junta has real changes in store for the beleaguered country. Last Friday, a Burmese official at the United Nations even went so far as to insist that the leader of the Burmese opposition, Aung San Suu Kyi, will have a chance to cast a ballot. Unfortunately, the full evidence suggests that the regime isn't inclined to initiate any deep reforms after 48 years of autocratic rule: Although Suu Kyi will be able to vote, she was barred from running for office, and her imposed house arrest has yet to be lifted. Nonetheless, Burma's rulers may be paving the way for their own eventual eclipse. Even flawed elections can make a meaningful difference to the people of Burma. Indeed, things could hardly get worse for them. For the duration of the junta's rule, the Burmese have been plagued by terrible government and a barely functioning economy: They have suffered rulers who were insecure in their hold on power, but who were capable of easily enriching themselves through natural resources like timber and opium. One of the reasons that Burma's economy is in such dire shape is that the junta has felt that economic growth would imperil their rule. The military junta, after all, hadn't merely imposed itself on an anarchic society -- it overthrew a popular democracy. Starving the country of dynamism has been one of the ways that the military has managed to consolidate its rule against the specter of an uprising among Burma's minorities. By introducing mild liberal reforms, the junta now wants to shift from near-constant crisis management to the cultivation of longer-term legitimacy and stability for the current regime. That's what these elections are more-or-less explicitly about -- in contrast to the country's last elections, which were held 20 years ago, in 1990. Then, the junta was taken by surprise by the victory of Suu Kyi. The regime's response was to reverse the results, and rescind all of its nascent democratic reforms at the time. This time, military leaders are making sure in advance that the outcome will be to their liking. Aung San Suu Kyi has been barred from running for president, 25 percent of legislative seats have been reserved for the military, and a powerful national defense and security council has been established that will be free of democratic oversight. Already, more than 20 high-ranking officials in the junta have resigned from the army to re-invent themselves as civilian candidates under the banner of a new party, Union Solidarity and Development Association. It's clear that the regime is less interested in establishing a democracy than in resisting pariah status on the international stage and forestalling discontent at home. Whether they're motivated by the bite of sanctions, the restiveness of domestic ethnic minorities, or the discontent of a younger generation of officers among the junta, Burma's rulers want to restore some measure of legitimacy for themselves -- without, of course, loosening their grip on the country's levers of power. But loosen it they eventually will. History shows that gradual, half-hearted reforms of this sort are exactly how many autocracies successfully transition to democracy. Rulers gradually liberalize laws while ensuring that they maintain their privileges and status, come what may. Chile's move to democracy, for example, was facilitated by protections that the new constitution gave to Pinochet and other leading generals. The process of political reform in 19th-century Britain was also smoothened by the ability of existing elites to protect their interests via the House of Lords. And the world's longest-running constitutional democracy -- the United States -- got its start because its "founding fathers" were convinced that the establishment of indirect elections for senators and the president would prevent radical, popular reforms. But, in all the above cases, the new openness produced a spurt of economic growth that eventually dislodged the old ruling class from its privileged perch over society. An instructive comparison is also offered by the experiences of Egypt and Iraq since the 1950s. In Egypt, Colonel Nasser initiated a new tradition: Rulers were still invariably drawn from the military ranks, but they would henceforth present themselves as civilian presidents -- highly restricted elections would even be set up to validate their rule. Iraq did nothing of the kind. While the Egyptian economy has achieved sustained growth since the 1950s, Iraq is probably poorer today than it was then. Egypt is still unfortunately far from being a full democracy, but far fewer of its citizens are in poverty than they were 50 years ago, and many more of them are educated. Flawed as Burma's current reforms are, they are unlikely to be the country's last. Once a process of liberalization has begun, it usually continues, however gradually. One instructive example is Taiwan. The island was long a one-party state dominated by Chiang-Kai Shek's Kuomintang. The group decided in the mid-1990s to introduce constitutional changes that would establish the country's first real elections, confident that the Kuomintang would continue to rule comfortably. They did, in fact, win the first election handily, but the process of competition forced the party to move away from its militarized roots and eventually allowed an opposition to flourish and challenge its monopoly. The gradual process also allowed the ruling and the opposition to normalize their relationship, so that the new leaders weren't fueled by revolutionary rage, and the old leaders were prepared to tolerate having lost their authority. Taiwan's experience offers a portrait of the most optimistic scenario for Burma -- that the new constitution and the upcoming elections will be the beginning of a process of gradual reform that improves the economy and political participation, while avoiding a serious backlash against the ruling generals. The alternative path to political change -- a push for radical reform that destabilizes the country and potentially produces a civil war -- is much more grim and, unfortunately, all too plausible.